A Decline in Prophets is Sulari Gentill‘s sequel to her celebrated debut novel A Few Right Thinking Men, shortlisted for the 2011 Commonwealth Writers’ Prize for Best First Book. 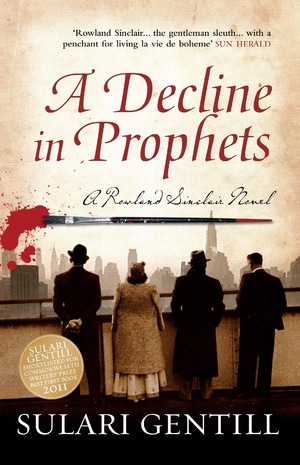 Sulari does such a great job of immersing the reader in the ambiance of the early 1930s, I’m inclined to describe A Decline in Prophets as ‘keen, snazzy, swell’ — an assured, engaging, highly entertaining novel from a talented and prolific author. 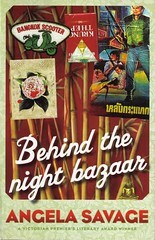 The hero of Sulari’s novels is gentleman artist-sleuth Rowland Sinclair. The story opens as Rowland is heading home to Sydney on the luxury liner RMS Aquitania after several months abroad with his posse — beautiful sculptress Edna Higgins, Rowland’s muse and secret love; communist poet Milton Isaacs, forever reciting other poets’ work; and fellow artist Clyde Watson Jones — a ‘bohemian set of poets and artists to whom he naturally gravitated [who] were not often from the elite and conservative circles into which he was born.’ Amongst those also aboard the Aquitania are founding members of the Theosophical movement, their would-be World Prophet who declined the mantle, an Irish Catholic bishop and his wayward niece. The atmosphere, tense to begin with, soon becomes deadly. There’s no respite once the group hit dry land either as the killings continue and various scandals undermine Rowland’s efforts to prove himself a worthy godfather to his brother Wilfred’s newest son. 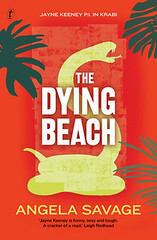 Gentill immerses her readers into the lives of the rich and famous in 1932-33 Australia, and briefly in New York, seamlessly weaving historical detail into a compelling plot. 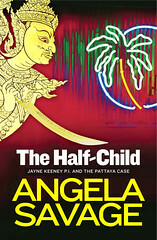 In my review of her first novel, I suggested the crime was incidental rather than central to the plot. That is certainly not the case with A Decline in Prophets, where the dead bodies keep mounting up. Sulari admits she may ‘subconsciously have been reacting to comments that A Few Right Thinking Men wasn’t really criminal enough….I killed everybody in sight!’ She need not worry about the crime credentials of A Decline in Prophets. There are many reasons to like Sulari’s books. Her characters are sympathetic and it’s fun to reconnect with them. Rowland plays wayward younger brother to his disapproving but loyal elder sibling. He continues to pine for Edna, who draws admirers like moths to flame, including one to watch out for called Archibald Leach. Milton’s role is largely that of the Fool in the classic tradition, and Clyde, one suspects, has untapped depths. Sulari also cleverly allows her fictional characters to rub shoulders — at times exchange kisses or pot-shots — with real people, adding to the sense of period authenticity. Look out, too, for a running joke involving Masonic rituals and the songs of George Gershwin. To sum up in the language of the 1930s, Sulari is one cool broad whose juicy books will blow your wig. A Decline in Prophets, published by Pantera Press, is released on 1 July 2011. 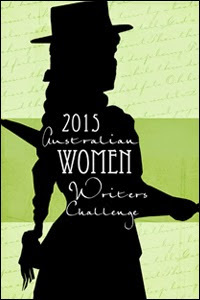 This review has been submitted as part of the Aussie Author Challenge. This entry was posted in Books and tagged A Decline in Prophets, A Few Right Thinking Men, Angela Savage, book review, Sulari Gentill. Bookmark the permalink.